Human Resources Training Materials are designed for trainers to develop the skills of the non-HR Manager. Train supervisors and managers how to understand job analysis, job competencies, the real cost of employee turnover, the role of compensation and benefits and much more! Seeing is Believing This sample manual to teach Human Resources is in MS Word format. 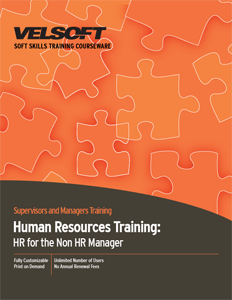 These human resource training materials include everything you need to train managers and supervisors on the HR functions included in their job. This three-day workshop covers the entire employee life cycle, from hiring to firing, and everything in between. Best of all, all components in the training package (including the handouts, instructor guide, PowerPoint slides, pre-assignment, outline, and more) are customizable. You can even add customizable eLearning to your human resources training offering. Check out a sample today!